MikroTik – CCR1072-1G-8S+ – PPPoE testing preview – 30,000 connections and queues. First of all, thanks to everyone for all the positive feedback, comments and questions about the CCR1072-1G-8S+ testing we have been posting in the last few months. Even MikroTik has taken an interest in this testing and we have gotten some great feedback from them as well. We received more questions about the PPPoE capabilities of the CCR1072-1G-8S+ than any other type of request. Since we have already published the testing on BGP, throughput and EoIP, we have decided to tackle the PPPoE testing to understand where the limits of the CCR1072-1G-8S+ are. This is only a preview of the testing as we are working on different methods of testing and config, but this will at least give you a glimpse of what is possible. It took us about 20 minutes to reach 30,000 connections…we are working on tuning the config to see if we can shorten the time it takes to build the connections. In the graph here, you can see it go form a 24 hour stable load of 30k connections donw to nothing as we prepare for a load test. At about 10:07 AM is when we started the full load test and you can see the time it takes to get to 30k. This is just a small preview of our full PPPoE testing. We will be completing testing and should be publishing the results within the next week. 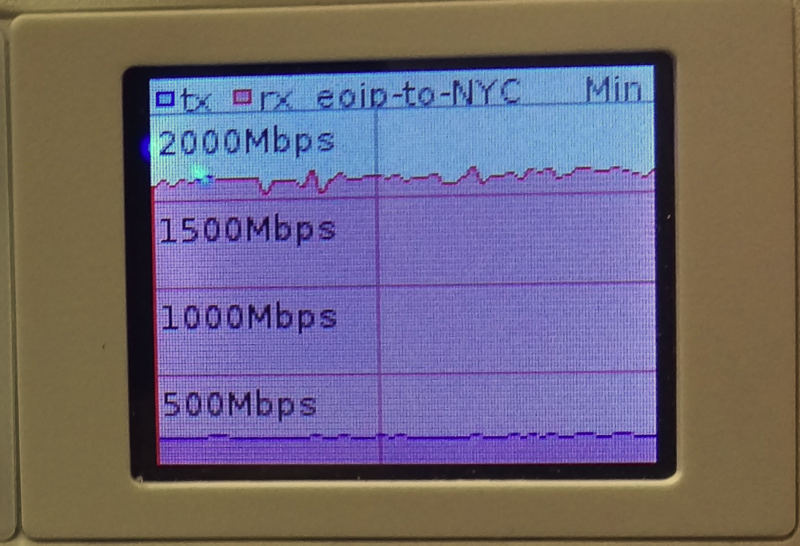 10 Gbps of Layer 2 throughput is possible using MikroTik’s EoIP tunnel. The EoIP tunnel protocol is one of the more popular features we see deployed in MikroTik routers. It is useful anywhere a Layer 2 extension over a Layer 3 network is needed and can be done with very little effort / complexity. One of the questions that seems to come up on the forums frequently is how much traffic can an EoIP tunnel handle which is typically followed by questions about performance with IPSEC turned on. Answers given by MikroTik and others on forums.mikrotik.com typically fall into the 1 to 3 Gbps range with some hints that more is possible. 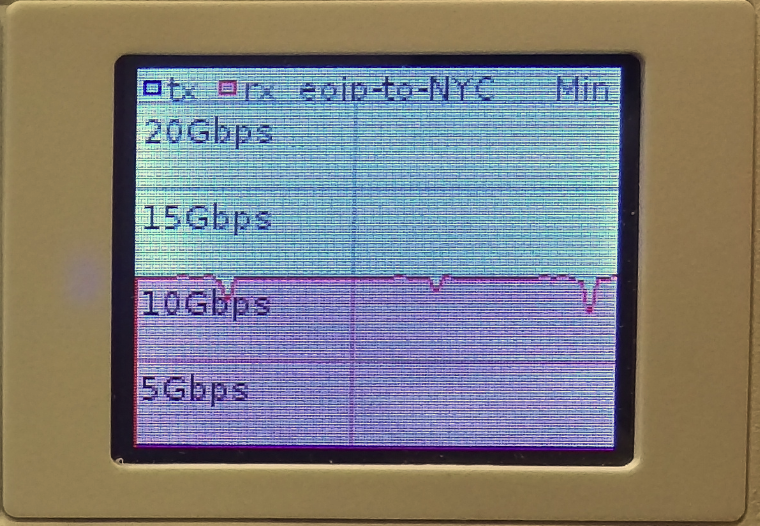 We searched to see if anyone had done 10 Gbps over EoIP with or without IPSEC and came up empty handed. That prompted us to dive into the StubArea51 lab and set up a test network so we could get some hard data and definitive answers. Ethernet over IP or EoIP is a protocol that started as an IETF draft somewhere around 2002 and MikroTik developed a proprietary implementation of it that has been in RouterOS for quite a while. Similar to EoMPLS or Cisco’s OTV, it faciltates the encapsulation of Layer 2 traffic over a Layer 3 network such as the Internet or even a private L3 WAN like an MPLS cloud. If you follow MikroTik and RouterOS updates closely, you might have come across a new feature that was released in version 6.30 of RouterOS. This is a much anticipated feature as it simplifies the deployment of secure tunnels immensely. It makes things so easy, that it really gives MikroTik a significant competitive advantage against Cisco and other vendors that have tunneling features in their routers and firewalls. When you look at the complexity involved in deploying a tunnel over ipsec in a Cisco router vs. a MikroTik router, there is a clear advantage to using MikroTik for tunneling. I originally looked into this feature for EoIP but it is available many other tunnel types like gre, ipip and 6to4. When you look at the complexity involved in deploying a tunnel over ipsec in a Cisco router vs. a MikroTik router, there is a clear advantage to using MikroTik for tunneling. Here is one of the simpler implementations of L2TPv3 over IPSEC in a Cisco router which still has a fair amount of complexity surrounding it. The MikroTik config has 3 required config items for EoIP on each router vs double the steps with Cisco and the added complexity of troubleshooting IPSEC if you get a line of config wrong. In order to test 10 Gbps speed over EoIP, we needed a 10 Gbps capable test network and decided to use two CCR-10368G-2S+ as our endpoints and a CCR1072-1G-8S+ as the core WAN. We used an HP DL360-G6 with ESXi as the hypervisor to launch our test VMs for TCP throughput. We typically use VMs instead of MikroTik’s built in bandwidth tester because they can generate more traffic and have more granularity to stage specific test conditions (TCP window, RX/TX buffer, etc). Most often, EoIP is implemented over the Internet and so using 9000 as a test MTU might be surprising to some users and possibly irrelevant, but when using a private WAN, quite often a Layer 3 solution is much less expensive than Layer 2 handoffs (especially at 10 Gbps) and 9000 bytes is almost always supported on that kind of transport, so L2 over private L3 definitely has a place as a possible application for EoIP with 9000 byte frames. The CCR1036 certainly had no issues getting to 10 Gbps with the right MTU and test hardware, but we were suprised that the IPSEC thoughput was so high. Considering a pair of CCR1036-8G-2S+ routers are just a little over $2000.00 USD, 7.5 Gigabits of encrypted throughput with IPSEC is incredible. Even over a 1500 byte MTU, the 1.7 Gbps we were able to hit is amazing considering it would probably take at least 20k to 30k USD to reach that kind of encrypted throughput with equipment from a mainstream network vendor like Cisco or Juniper. Layer 2 network extension for network migration or merger.